From the same fun folks who brought you Chia Cam – the plants are all now officially dead, by the way – we introduce Ca-nation Cam. It’s the science project that was so much fun that we had to replicate it at home. 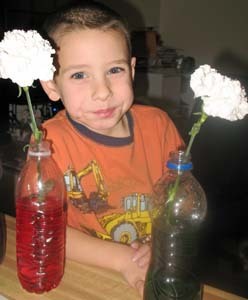 It all started a few weeks ago when Boots’ preschool teachers brought in flowers, plastic bottles and food coloring. When we picked the kids up that day, parents pretended we didn’t what was going to happen. Boots’ eyes got wide the next morning when he saw that one flower had just a hint of yellow on the tips of its petals. “Wow! Amazing!” he exclaimed. What’s even more amazing is that a kid who describes something as “amazing” cannot say “carnation.” It’s “ca-nation” – maybe that’s a sign that I’m not send flowers often enough. When we went to the PX at the end of the week, he wanted to buy some to replicate the experiment at home. Big Guy, whose class did the classic celery project a few weeks earlier, was enthusiastic, too. So I choked as I spent $12 for four ca-nations, knowing that that sum would have bought a huge bouquet in the real world. When you’re the only flower shop within 30 miles, though, you can get away with jacking up the prices. We went home and dug four bottles out of the recycling bag Big Guy had forgotten to take to school that day – he protested until I promised I’d give them back. We added water and exactly 12 drops of food coloring to each bottle. Then we sat back and waiting to be wowed.